Needle felting can also be used to create realistic 3 dimensional animals. A wire armature can be created to help the process and provide support, around which a needle felted body and coat can be added. Here are some examples. The art of needle felting is becoming very popular worldwide. A complex blend of Merino wool. Invented in the mid 17th century and used until the mid-20th centuries, a process called "carroting" was used in the manufacture of good quality felt for making men's hats. Beaver, rabbit or hare skins were treated with a dilute solution of the mercury compound mercuric nitrate. The skins were dried in an oven where the thin fur at the sides turned orange, the color of carrots. Pelts were stretched over a bar in a cutting machine, and the skin was sliced off in thin shreds, with the fleece coming away entirely. The fur was blown onto a cone-shaped colander and then treated with hot water to consolidate it. The cone then peeled off and passed through wet rollers to cause the fur to felt. These 'hoods' were then dyed and blocked to make hats. The toxic solutions from the carrot and the vapours it produced resulted in widespread cases of mercury poisoning among hatters. This may be the origin of the phrase "mad as a hatter" which was used to humorous effect by Lewis Carroll in the chapter "A Mad Tea Party" of the novel Alice in Wonderland. Russian valenki with attached a waterproof sole. 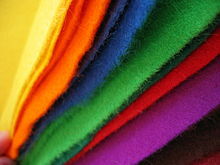 ^ "What's the difference between wool, acrylic, wool blend, and eco felt? Part 1 Wool". 31 March 2009. ^ "Acrylic felt & eco- felt (I.E eco spun) same damn thing! Part 2 of whats the difference between wool, acrylic, wool blend, and eco felt?". 1 April 2009. ^ "Wool Felt Blends- part 3 of Whats the difference between wool, acrylic, wool blend, and eco felt?". 4 April 2009. ^ Chad Alice Hagen (2005). Fabulous Felt Hats: Dazzling Designs from Handmade Felt. Lark Books. pp. 8–. ISBN 978-1-57990-542-2. ^ Dan Howard (2011). Bronze Age Military Equipment. Casemate Publishers. pp. 69–. ISBN 978-1-84884-293-9. ^ a b c Chris Thompson (2011). Felt: Fluxus, Joseph Beuys, and the Dalai Lama. U of Minnesota Press. pp. 56–. ISBN 978-0-8166-5354-6. ^ The Recent Development of American Industries. University of Pennsylvania Press. 1891. pp. 63–. ^ Melvyn C. Goldstein; Cynthia M. Beall (1994). The Changing World of Mongolia's Nomads. University of California Press. pp. 147–. ISBN 978-0-520-08551-0. ^ Becky Kemery (2006). 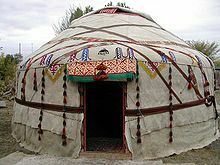 Yurts: Living in the Round. Gibbs Smith. pp. 160–. ISBN 978-1-58685-891-9. ^ Front Lines. U.S. Agency for International Development. 2006. ^ Maria Block; Varis Bokalders (9 February 2010). The Whole Building Handbook: "How to Design Healthy, Efficient and Sustainable Buildings". Routledge. pp. 57–. ISBN 978-1-136-54328-9. ^ Sabine Fouchier (12 February 2009). Felt. A&C Black. pp. 9–. ISBN 978-0-7136-8494-0. ^ Teachers World. Bemis Publishing Company. 1893. pp. 219–. ^ O. J. Petrie (1995). Harvesting of Textile Animal Fibres. Food & Agriculture Org. pp. 19–. ISBN 978-92-5-103759-1. ^ The Chemical News. Mitchell. 1860. pp. 257–. ^ Sarah E. White (1 January 2008). Picture Yourself Felting Your Knitting: Step-by-step Instruction for Perfectly Felted Crafts. Course Technology. pp. 10–. ISBN 978-1-59863-665-9. ^ Krishan Chawla (2 June 2016). Fibrous Materials. Cambridge University Press. pp. 24–. ISBN 978-1-107-02972-9. ^ Technical educator (1871). The technical educator, an encyclopædia. pp. 1–. ^ Andrea Price; Patti Pierce Stone (13 September 2011). Knitspeak: An A to Z Guide to the Language of Knitting Patterns. STC Craft, Melanie Falick Books. pp. 76–. ISBN 978-1-4532-2078-8. ^ “Everything You Need to Know to Start Needle Felting.” Wunderlabel, 22 Aug. 2017, wunderlabel.com/blog/everything-need-know-start-needle-felting. ^ Alicia Kennedy; Emily Banis Stoehrer; Jay Calderin (1 February 2013). Fashion Design, Referenced: A Visual Guide to the History, Language, and Practice of Fashion. Rockport Publishers. pp. 153–. ISBN 978-1-59253-677-1. ^ Wonderful West Virginia. Department of Natural Resources. 2005. ^ a b c Jack Larkin (23 November 2010). Where We Worked: A Celebration Of America's Workers And The Nation They Built. Lyons Press. pp. 95–. ISBN 978-1-4617-4592-1. ^ a b Mary Ellen Snodgrass (17 March 2015). World Clothing and Fashion: An Encyclopedia of History, Culture, and Social Influence. Routledge. pp. 251–. ISBN 978-1-317-45167-9. ^ a b Beverly Chico (3 October 2013). Hats and Headwear around the World: A Cultural Encyclopedia: A Cultural Encyclopedia. ABC-CLIO. pp. 309–. ISBN 978-1-61069-063-8. ^ Bonnier Corporation (November 1941). Popular Science. Bonnier Corporation. pp. 52–. ISSN 0161-7370. ^ Cooper-Hewitt museum description of Mosen rug. ^ Ethan Winer (12 November 2012). The Audio Expert: Everything You Need to Know About Audio. CRC Press. pp. 629–. ISBN 978-1-136-12614-7. ^ Hugo Pinksterboer (1 January 1993). The Cymbal Book. Hal Leonard. pp. 88–. ISBN 978-1-4768-6639-0. ^ Steven L. Schweizer (28 June 2010). Timpani Tone and the Interpretation of Baroque and Classical Music. Oxford University Press. pp. 13–. ISBN 978-0-19-975041-2. ^ Nicholas J. Giordano (8 September 2016). Physics of the Piano. OUP Oxford. pp. 113–. ISBN 978-0-19-250663-4. ^ Robert Palmieri (1 June 2004). The Piano: An Encyclopedia. Routledge. pp. 161–. ISBN 978-1-135-94964-8. ^ David C Wickens (1 December 1987). The Instruments of Samuel Green. Palgrave Macmillan UK. pp. 44–. ISBN 978-1-349-09059-4. ^ Arthur W. J. G. Ord-Hume (1978). Barrel organ: the story of the mechanical organ and its repair. A. S. Barnes, Incorporated. ISBN 978-0-498-01482-6. ^ Thomas Campbell Young (1947). The Making of Musical Instruments. Oxford University Press. ^ Deborah Schneiderman; Alexa Griffith Winton (28 January 2016). Textile Technology and Design: From Interior Space to Outer Space. Bloomsbury Publishing. pp. 48–. ISBN 978-1-4742-6196-8. ^ Beverly Gordon (May 1980). Feltmaking. Watson-Guptill Publications. ^ Joseph Beuys; Volker Harlan (2004). What is Art? : Conversation with Joseph Beuys. CLAIRVIEW BOOKS. pp. 65–. ISBN 978-1-905570-07-2. ^ Dietland Muller-Schwarze (7 April 2011). The Beaver: Its Life and Impact. Cornell University Press. pp. 156–. ISBN 0-8014-5010-1. ^ Eric Jay Dolin (5 July 2011). Fur, Fortune, and Empire: The Epic History of the Fur Trade in America. W. W. Norton. pp. 22–. ISBN 978-0-393-34002-0. ^ Bernard A. Drew (22 December 2009). Literary Afterlife: The Posthumous Continuations of 325 Authors' Fictional Characters. McFarland. pp. 45–. ISBN 978-0-7864-5721-2. ^ Brenda Grantland (1 June 2016). Hatatorium: An Essential Guide for Hat Collectors. Brenda Grantland. pp. 76–. ISBN 978-0-9847859-0-2. ^ Russia Beyond The Headlines (12 December 2014). Russian Winter: Photo album. Russia Beyond The Headlines. pp. 91–. GGKEY:G7NRFZX3WQF. ^ Symposium on Antarctic Logistics, Held at Boulder, Colorado, August 13-17, 1962. National Academies. 1963. pp. 637–. NAP:12264.